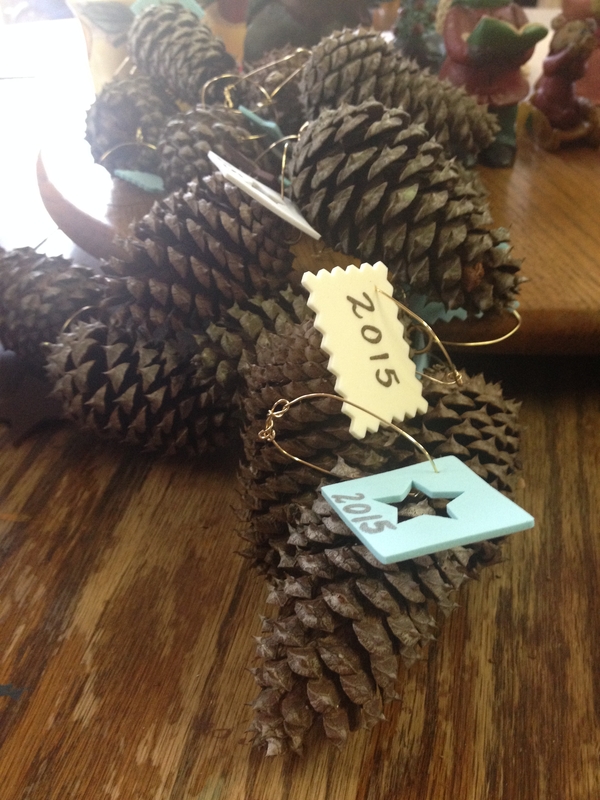 I’m just popping in to show you how I made my homemade pinecone Christmas ornaments for my church family this year. These were not difficult to do, and they turned out to be one of my favorite annual church Christmas ornaments! Ok, so there may have been a bit of pain involved, but I found a way around that, too. This is one that she made from the old tin roof of the church! The church had the roof replaced during their tenure there, and she had pieces of the tin cut into the cross shape. These are probably my favorite out of all the ones she made. Christmas is only nine short days away, so I’m cutting it close with my ornament making this year! Who am I kidding; I cut it close every year! I’ve just finished up my homemade pinecone Christmas ornaments for church, so you lucky dogs get to see them first! You may have figured out by now that I have an affection for nature, and I love using it in my crafts. I decided to make pinecone ornaments because our yard is completely littered with them. There is so much beauty to be found in my own back yard, and I love taking advantage of God’s handiwork! Making nature Christmas ornaments for church was a no-brainer for me. Pinecones are some of my favorite things in the world, even though they’re prickly and get on Coach’s last nerve when he’s trying to cut grass. I figure the more I pick up and use, the less he’ll have to contend with on his mower! I decided a while ago to use pinecones in my ornaments this year, but, of course, I didn’t start collecting them until grass-cutting season had ended. I was cruising around on Pinterest one day and saw this little trick, which basically helped me decide what my homemade pinecone Christmas ornaments would look like! This little tip helped me tremendously! 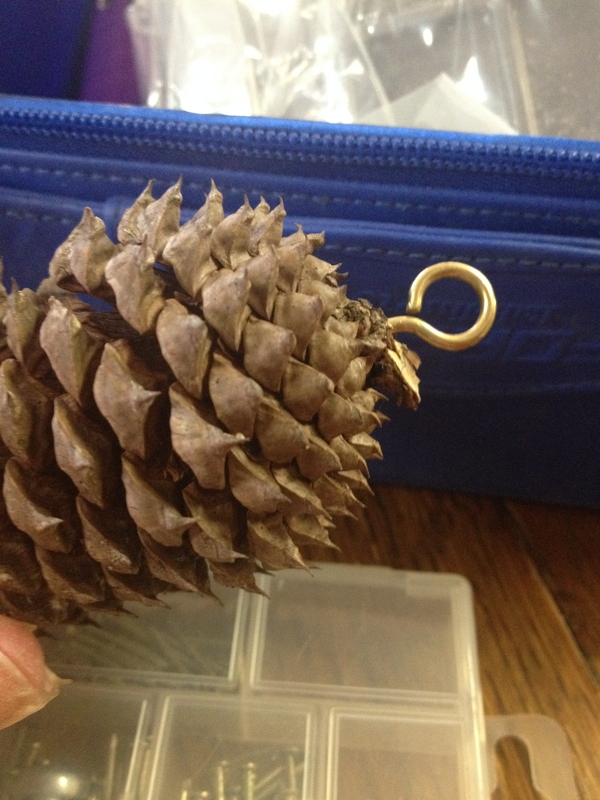 You just screw the little eye hook into the end of the pinecone! (You can find these super-cheap on Amazon. Here’s a 50-pack, or you can grab a 12-pack for even less.) It made for some easy pinecone ornaments, but I did wear a glove with my pinecone-holding hand, which helped keep me from getting poked (see how I find a way around pain?). 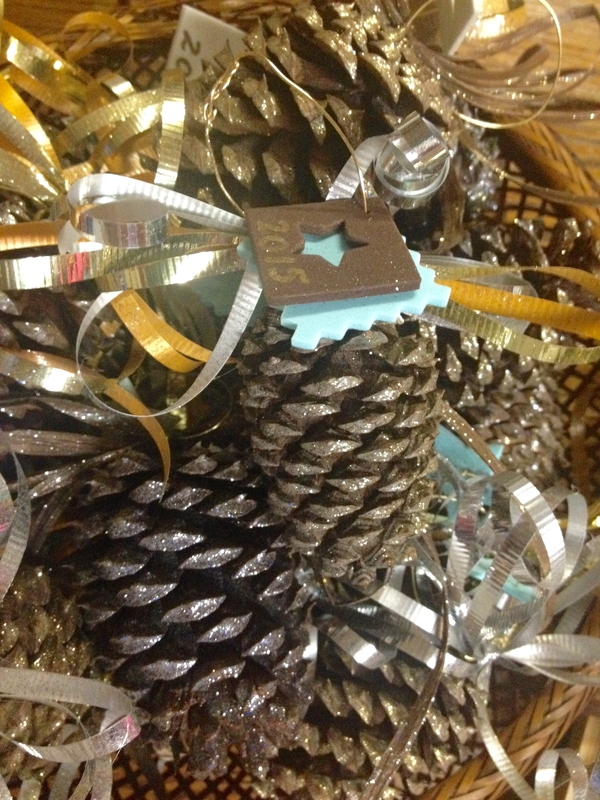 The pinecone is the ornament! All I needed was a cute way to put the year on them. 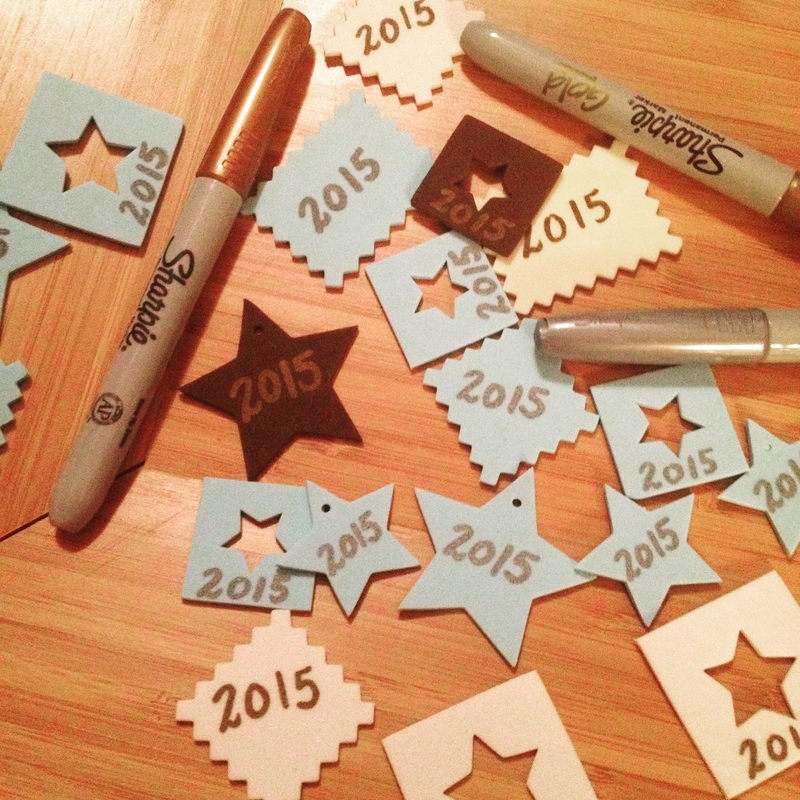 I used foam sheets to make tags, and cut out stars with my cute little star punch I found on Amazon (here is the bigger star punch for the star tags). The others I cut with these awesome craft scissors. 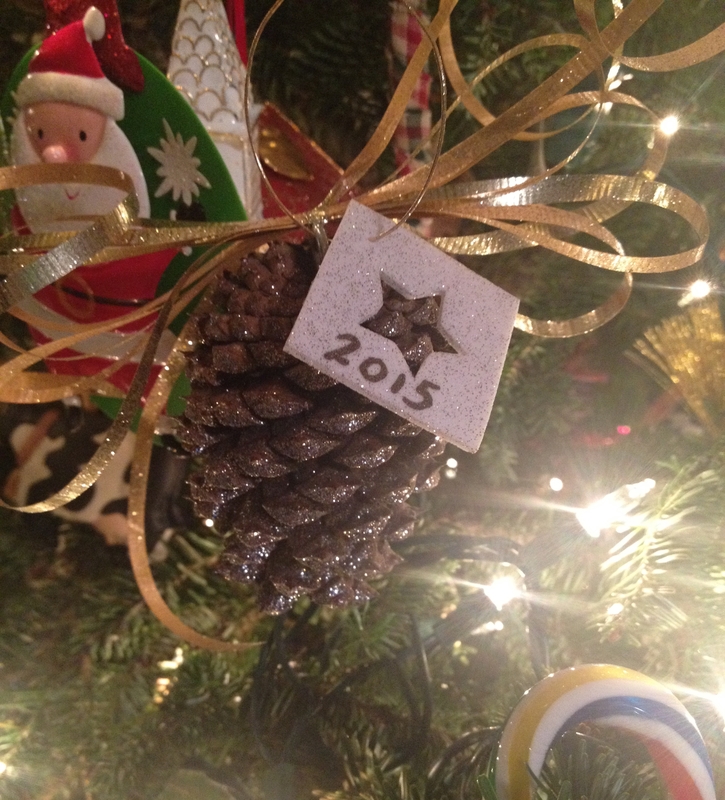 I used gold craft wire to attach the year, which I poked myself with more than I would have the pinecones. I added the year with my favorite Metallic sharpies, also found on Amazon. They’ve come out with some metallic Sharpie paint pens that I really want, but I haven’t tried them yet….I bet they’d work beautifully, as well. All that was left was to add some ribbon, and some glitter, because silver and gold pinecone ornaments are better than plain ones any day! I think they turned out very well, and will make a pretty, straight-from-nature adornment on everyone’s tree! 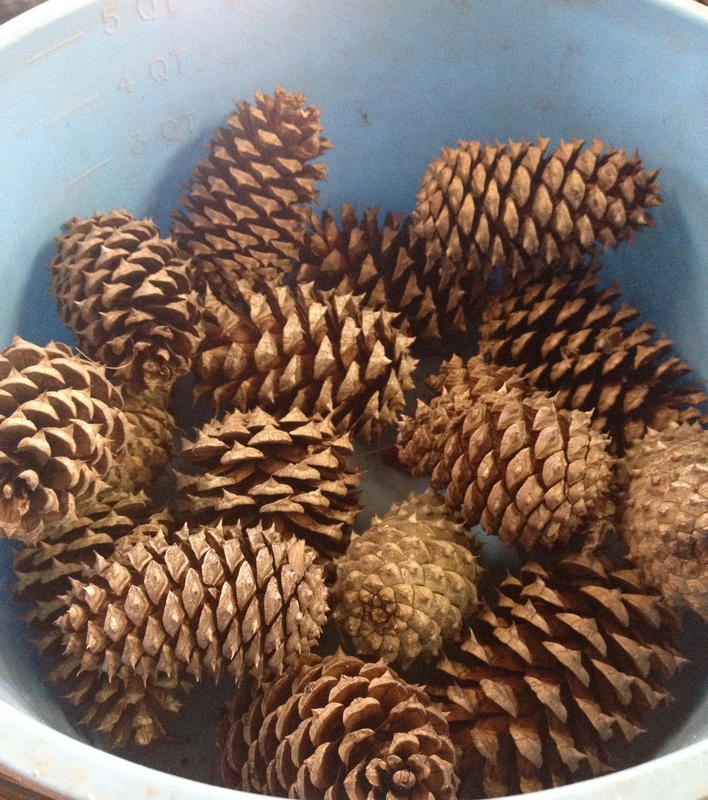 Oh…another tip I wanted to mention: you can dry pinecones in the oven if you have to use them in a rush. I let my first round just hang out on the back porch for several days, and they dried out and opened up nicely. After I got all those done, I was asked to make 15 more for some goodie baskets that our church ladies are planning to distribute to shut-ins. I needed to get these done quickly, so I poked my pinecones into a 200-degree oven on a foil-lined baking sheet for about 30 minutes. You’ll find a million varying directions for baking them, but I like to go with the simplest. I’ll give these to my church family on Sunday, which will give them a week to enjoy them! I do so wish I could plan ahead better…but then, I just wouldn’t be me. I’d like to thank Jimmie for tying a whole slew of bows for me, and Coach for spraying all of the pinecone ornaments with glitter. His work coat that he wore for protection is now covered in glitter, which will make him the laughing stock of all the chickens, but he’s pretty confident in his manliness. I hope you crafty folks will play around with some pinecones sometime, too. If you’re not crafty, then you can collect them anyway! If you don’t like the way they look, you can use them for fire starters…place 3 or 4 in a small paper sack and light it under your logs! Pinecones are just handy little dudes, aren’t they? Enjoy your holiday season, folks. It’ll be over before we know it! Did you not see my thank you?? Great post! You have a way with words ? Thanks! Could you see all the pics? Struggling this morning to get everything right! You are welcome any time! 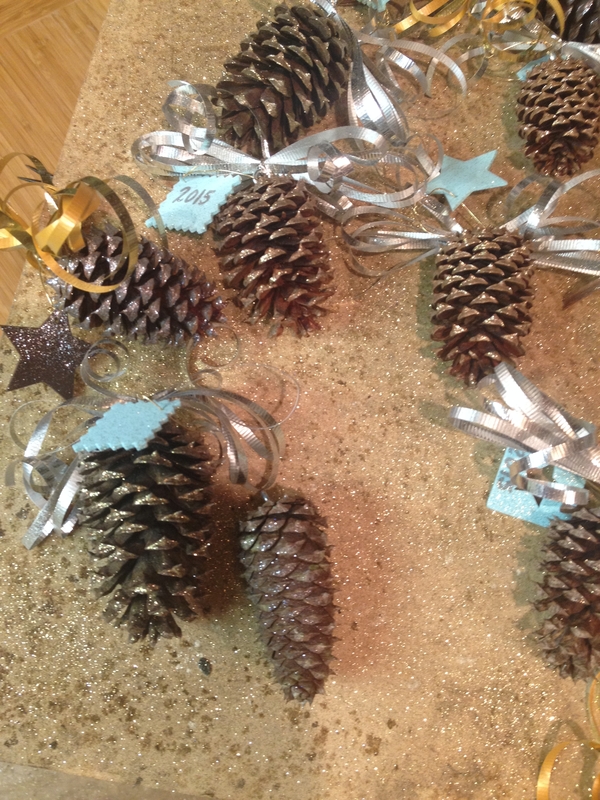 The more pinecones gone, the happier Coach will be! ? They are so sparkly….and prickly! Lol! I love them. Hope there’s one leftover for my own tree! Thank you, hope you find some! Are pine trees indigenous to your area? I’ve never been to the UK, so I’m unfamiliar.